If you would like to make a contribution to the Kaleidoscope Theatre Company, please write your check out to Kaleidoscope Theatre Company, Inc. Kaleidoscope is a not-for-profit 501(c)(3) organization and your contribution is fully tax-deductible. If your employer has a matching gift program, please think of us; it is an excellent way to double or triple the impact of your generosity. Thank you. Benjamin Alfonsi (Man) is happy to be making his New York stage debut in The Game. He is also a screenwriter. His first screenplay is a thriller called Silent Night, and he currently has two others in the works. Benjamin has appeared on All My Children and will soon be seen on Guiding Light as RenaIdo. Thanks to his family for their constant love, Irene for her inspiration and support and, especially, Henry and Ann at Ann Steele Agency for being "true believers." Ned Butikofer (Connie) New York/Regional Credits include Harold in Kessler's Orphans, the Captain in Bruchner's Woyzeck, Mathieu Dreyfus in The Dreyfus Affair (NYCO), Fool and Sir Gawain in the Christmas Revels (NYC Revels, Inc.). Tregorin in Chekhov's The Seagull, Floyd in Jones's The Oldest Living Graduate, Shakespeare in Slover's A March Tale (BYU Guest Artist). Most recently, he received the Jekyll & Hyde Award for his performance as Dukes Senior & Frederic in Shakespeare's As You Like It (Illyrium Productions). He received his MFA in Acting from SMU in Dallas. Ümit Celebi (Stan) was most recently in Migdalia Cruz's Featherless Angels at the University of Connecticut. Off-Broadway: A Dybbuk (NYSF), The Triumph of Love (CSC). Regional: Hysteria (Pittsburgh Public) - 1998 Best Supporting Actor I Pittsburgh Post-Gazette, Romeo and Juliet (Alliance), Dark Rapture (ACT). Other NY credits include Happy End (Irondale Ensemble). Richard Foreman's The Golem (NYSF/Delacorte). and Hydriotaphia written and directed by Tony Kushner. Film and TV credits include Law & Order, and the upcoming Dead Dog. Omit has known Marshall since first grade, and is delighted to be a part of the first Kaleidoscope production. Cynthia Firing (Kala) was last seen in the dramatic arena as Tori in Marshall Mays' Dance in the Giddy Circle at the Trilogy Theatre. More recently she has been sharing her talents on the operatic stage appearing as Gilda in Rigoletto and Adele in Die Flederma us. This fall she will reappear as Adele in New Rochelle Opera's revival of Die Fledermaus as well as appear in concert with the Hudson Valley Opera. In the spring of 2000 she will appear as Violetta in La Traviata with Inwood Opera. Ms. Firing is psyched to be a part of the Kaleidoscope Theatre Company's first production and she wishes her friend Marshall continued success. Georgia Hatzis (Woman) Is pleased to be performing with Kaleidoscope in their virgin run, here, in New York. In her bio, she would like to pay homage to some of her favorite roles: Helena In A Midsummer Night's Dream, Hayyah In Ghetto, and Paulinka in A &ight Room Called Day, to name a few. Georgia would like to thank her family and friends for all of their support and a very special thanks to Marshall and Benjamin for teaching her how to play chess...sort of. Donato Lemmo (Jesus) has worked extensively in the theatre in New York, Philadelphia and California. He played Walker in Lee Blessing's Two Rooms which recently won an OOBR Award for Best Play. He is a member of The Actors Studio and received his MFA from The ActorsStudio/New School. Jan Owen (Lou) appeared in An Inspector Calls on Broadway and toured in The Subject Was Roses and Spoon River. Favorite regional roles are Stella in Light Up the Sky and Elizabeth in Mary Stuart. She appeared as Daisy in Driving Miss Daisy, as Mme. de Rosemonde in Le Liaisons Dangereuses, as Sally Friedman in Fifth of July, and as Mrs. Chichester in Peg 0 'My Heart at the Dorset Theatre Festival. New York credits include Mrs. Wilson in Brian Friel's Lovers at the Irish Arts Center, Dorothea in Lee Blessing's Eleemosynary at the John Houseman Studio Theatre and television's Law and Order and Spin City. Nancy Rogers (Armitage) comes from Texas where she worked as a company Member of Stages Repertory Theatre company in Houston, playing such roles as Mrs. Antrobus, Gwendolyn and Algernon (in rotating repertoire), Alice from Blue Window and many Durang characters including Sister Mary Ignatius. 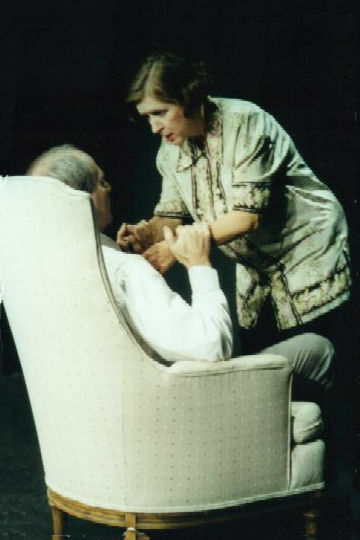 Nancy participated in the Texas Playwrights Festival for more than five years as actor, director and playwright, working on several world premieres, including Jack Hefner's Tropical Depression. She has an MFA from the University of Texas. Celeste Walker (Rachel) has an MFA in Acting from The Actors Studio School of Dramatic Arts at the New School and is a lifetime member of The Actors Studio. Most recently she played Maria Callas in a Regional Theatre production of Master Class. New York theatre credits include: Sarah in The Lover, Beatrice in The Effect of Radiation on Man- in-the-Moon Marigolds, Mrs. Pierce in Not Enough Rope, Miss Bitchstien in Jeff Weiss's And That's How the Rent Gets Paid Part IV and Celeste in Madness, another Liz Bartucci play. Ms. Walker also teaches at Theatre for a New Audience, The University of Scranton and Muhlenberg College. Laura Henry (Playwright) has had plays produced 0ff-Off-Broad way, regionally, and in Canada and the United Kingdom. The Game has been produced several times, most notably at the Tennessee Williams Theatre Festival in Memphis, Tennessee. It has also been included in The Best Stage Scenes of 1998 (Smith & Kraus). Laura is a graduate of Baylor University and is currently attending the MFA playwriting program at UCSD. Christopher Renstrom (Playwright) is delighted to be working with Marshall Mays again so soon after the premiere of Renstrom's Zion at The Theater Outlet in Allentown, PA last December. He is extremely honored that Unearthed is part of Kaleidoscope's first season. Other plays include The Monk - produced by The Bad Neighbors Theater Co. and directed by Michael Yawney, Widow's Walk (also produced by Bad Neighbors), and various miscellany performed on WBAI and at Dixon Place. Mr. Renstrom is the horoscope columnist for Conde' Nast's Allure Magazine, The San Francisco Chronicle, and is syndicated by Tribune Media Services. His current work-in-progress delves into Watergate. Marshall Mays (Director) is the founder and Artistic Director of the Kaleidoscope Theatre Company and is delighted to be working again with many of these actors and these three playwrights. He has directed four critically acclaimed productions at the Theatre Outlet in Allentown: Craig Lucas's Reckless, Clifford Odets' Waiting for Lefty, Steve Martin's Picasso at the Lapin Agile and the world premiere of Christopher Renstrom's Zion. This past January, he directed a workshop at the Theatre Outlet of The Calling by Liz Bartucci. He has also directed new plays with PA Stage Company's New Evolving Works series and The Blueprint Company at New York City's First Annual Fringe Festival. As an actor, Marshall has appeared in over 50 productions including work at New York's Gene Frankel Theatre, The Mint Space, The Women's Project and Productions, the Pennsylvania Stage Company, Pennsylvania Centre Stage, Wilkes-Barre's Theatre-on-the-Green, the Houston Shakespeare Festival, Stages Repertory Theatre and Main Street Theatre in Houston. Marshall is the author of The Mirror up to Nature and To Have and to Hold/Dance in the Giddy Circle which was the hit of the First Annual Festival of New York Plays at Soho's Synchronicity Space. Dance in the Giddy Circle was subsequently produced at the Trilogy Theatre and ran for a month in 1996. Dean Gray (Sound Designer) has designed sound for Guillermo Reyes' Miss Consuelo, Robert Clyman's The Lower Cortex at Playwrights Theatre of New Jersey and Athol Fugard's Blood Knot at the 78th Street Theatre Lab. He has directed Jim Grimsley's Math and Aftermath for Harland Productions, The Borderland at Currican and Marshall Mays' To Have and To Hold at Synchronicity, and most recently A.R. Gurney's Sylvia for the University of Wisconsin. He has stage managed for Ensemble Studio Theatre, Bay Street Theatre Festival, Michigan Ensemble Theatre and Signature Theatre Company. Sarah Brandenburg (Stage Manager) graduated with a B.A. in theatre from St. Olaf College in Minnesota. She has stage managed once before -- for the Company of Players' production of Pericles. She appeared in an independent short horror film this past winter, and hopes to do more performing. She is very excited to be a part of Kaleidoscope Theatre Company's first production, and looks forward to working with them in the future. Thanks to her "New York family" for keeping her positive and for always being there. At Kaleidoscope, we believe that theatre exercises our humanity, it stretches our compassion, it feeds our wit, and it refines and marinates our wisdom. Theatre expands our personal experience, challenges our thinking, and reveals the true realities of our existence in small doses. Very small doses. It's really great if it can be funny too. We see ourselves as stealth educators in humanity, society and reality. Please humor us in this regard. Our audience is a treasured part of our ensemble and we feel we owe you the very best that we can offer. We truly believe that great comedic plays can have a transforming power and our mission is, with laughter, to fling our audiences "into a kaleidoscope of new possibilities."